Seven friends on a camping holiday find themselves the targets of a spree killer being hunted by the FBI. A frightened woman runs through the forest and comes upon a campsite with dead bodies. She arms herself and hides, but an unknown attacker stabs her in the stomach and she dies. Jim and his girlfriend Andrea drive out to the woods for a camping getaway. With them are Andrea’s sister Dana, Dana’s boyfriend Adam, Angel and his girlfriend Mandy, and their diabetic friend Dave. Meanwhile, Agent Lindsey of the FBI finds two hunters in the forest and shows them the picture of a man he is searching for. That same man is seen watching the seven friends from behind a row of trees. Angel upsets the others when he shows everyone the handgun he brought along. He and Mandy go off alone together while the others make camp. Thinking that her boyfriend is about to propose to her, Andrea becomes upset when Jim reveals that he enlisted in the Marines. Dave finds a trail of blood and runs back to camp to tell the others. He, Jim, Andrea, Adam, and Dana investigate. After Jim finds two dead bodies, a Marine comes out of the trees accusing Jim and his friends of having killed the others. The Marine’s girlfriend, whom he calls Baby, holds Jim and his friends at gunpoint. Elsewhere, Agent Lindsey finds the man he is looking for, who turns out to be fellow FBI agent Weston. Weston has been tracking the killer he believes is currently in the woods. The Marine forces Jim and his friends to play a series of sadistic games before shooting Dave and revealing himself as the real killer. Dana is shot while escaping and later dies from her wound. Thinking that he is about to sneak up on the Marine, Jim stabs at a body in a tent that turns out to be Angel bound and gagged. Mandy is also murdered. The Marine takes everyone hostage again. The Marine forces everyone to play Russian Roulette. Adam ends up shooting himself. The Marine forces Jim to pretend he is a hunter to two forest rangers while holding Andrea hostage. The rangers become suspicious and the Marine kills them, but not before one of them handcuffs Jim. While the Marine chases Andrea into the woods, Jim escapes his cuffs and stabs Baby in the eye with Dave’s insulin needle. Jim tracks down the Marine and shoots him in both legs. When Jim goes to retrieve the approaching FBI agents, Baby reappears and slashes Andrea’s throat. Distraught, Jim shoots Baby and turns the gun on the Marine. Believing that Jim is the Marine’s accomplice, Agent Weston forces Jim to throw down his handgun and tries taking him into custody. Having become a killer, and realizing that he wants the Marine to pay for what he has done, Jim kills both FBI agents so that he can break free and shoot the Marine. A jeep blaring loud music honks its horn and screeches to a halt near a copse of trees. Out spills a trio of flip-flopped twentysomethings lugging a cooler, fist bumping four other friends, and spiking house keys into beer cans to signal the start of their outdoor getaway. Coming in hot behind an opening scene of an unknown assailant slaughtering campers in the forest, this is the moment when a viewer might understandably groan while slapping a palm over the eyes. Is this really another horror movie about partying college kids killed one at a time by a madman in the woods? Not exactly. 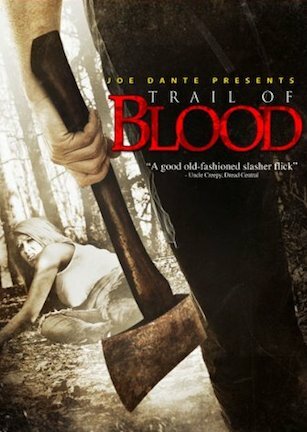 “Trail of Blood” intentionally puts in significant effort to give the first impression of a typical slasher film. And while it is a slasher at its core, it does all it can do to not be entirely typical. “Trail of Blood” sets the stage for convention so that it can alter expectations before veering into an adjacent lane or into oncoming traffic. This is a movie that tries manufacturing thrills with sleight of hand and through twists that are not as unexpected as the story needs them to be. “Trail of Blood” is the suspense equivalent of a magician dexterously shuffling cards to say, “look over there” while the real payoff turns out to be something else. The downside is that when it comes to expertly pulling off illusions, the movie is more of a mediocre cups-and-balls performer than a full-fledged David Copperfield. Trevor Torseth = Marc Singer + Hacksaw Jim Duggan's beard + Amazing Jonathan's headband? Before adding shots of police procedural and psychological thriller into its bloodstream, “Trail of Blood” toys with being upfront about where the plot is headed and for what purpose. The effort is noble for going against the grain of routine maniac-killing-teens-in-the-woods boredom, but the intention exceeds the execution. Red herrings regarding the killer’s identity and other misdirection moments about impending dangers fail to add tension because they are mistimed. Swelling stings and unknown hands grabbing from dark corners come too early in the runtime to be anything besides false scares. Other gimmicks hoping to bamboozle the audience into thinking a certain person is someone else are similarly far too telegraphed to be effective. “Trail of Blood” is decent enough for mild entertainment value. It just has a slight stench of stale plot devices wrinkling the nose without coming across as clever. The FBI agents trailing the murder suspect are alternatively within arm’s reach of the campers and then suddenly miles away. Depending on where the script needs them to be at any given time, they hear and follow certain gunshots while others never register at all. And while this is likely a personal inference, it is hard to take the Marine character seriously when he so closely resembles a mix between Hacksaw Jim Duggan and The Amazing Jonathan. Other jagged edges further dull the film’s overall impact. Digital blood is too obvious. The connection between two characters being U.S. Marines strains overly hard to make sense. “Trail of Blood” is a movie that tries, and comes close, to doing something different than most films with similar starting points. In the end, it is a case of some eye-rolling individual moments and unconvincing miscellany adding up to a whole that is average, yet far from noteworthy.